Inter-Configuration Network Routing (ICNR) lets you connect multiple environments together. VMs in one environment can communicate with VMs in another environment, or VMs in multiple environments can communicate with shared services in dedicated environments. It’s possible to create up to 100 ICNR connections for an environment but multiple active connections can significantly slow power-state changes for the connected environments. Environments must be in the same region to connect using ICNR. By default, each environment is isolated from other environments in your account. ICNR connects the networks in multiple Skytap environments, which allows VMs on those networks to communicate with one another. It can also be used to split large environments up into smaller environments so that you can restrict access to sets of servers. When you set up ICNR, be sure to avoid IP overlap between networks. Either enable Network Address Translation (NAT) on the Skytap networks or manually design environment networks to avoid overlaps (see Avoiding overlapping IP address spaces). The figure below shows the conceptual view of the environments with and without ICNR. By default, a network in an environment is not visible to networks outside of the environment. Navigate to the Network Settings tab of the Settings page. The Network Settings page displays. Click the Edit Network button next to the network. The Edit network window displays. Check the Visible to other networks checkbox. While you’re editing the network, you may also want to enable Network Address Translation (NAT), detailed in the next step. Otherwise, click Save Changes. Network Address Translation (NAT), is a process that maps each internal Skytap network address (such as 192.168.1.1) in a network to an external network address (such as 172.16.25.12). Other networks detect and send data to the external network addresses. Enabling NAT means that you don’t have to manually change the subnets of connecting networks to avoid overlaps. For more information, see Using Network Address Translation (NAT) to avoid IP address conflicts. NAT can only be enabled for automatic networks that have been made visible to other networks (as in Step 1, above). 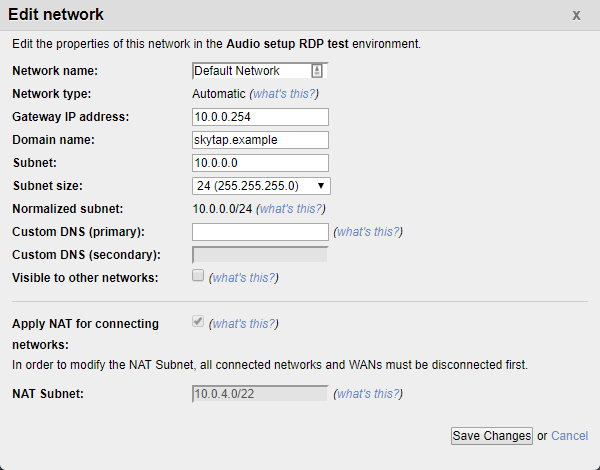 In the Edit network window, click the checkbox labeled Apply NAT for connecting networks. The NAT Subnet field is automatically filled with a subnet that has no overlaps with any other networks that you have access to. When you use ICNR, this prevents overlap between connected networks, as even networks with identical IP addresses are assigned separate, unique addresses. You can manually enter a NAT subnet of your choosing. Navigate to the Network Settings page of the environment you want to connect to the centralized servers. Click on the Connect to a network link for the network you want to connect (Network 1 in the example below). Click the Connect to Network button. The networks are connected to each other and able to exchange data. Repeat this process for each additional environment you want to connect using ICNR. Networks in an environment are automatically connected to each other. You don’t need to do anything to connect networks in the same environment. You can control whether traffic flows through a connection between networks in the same environment with the Allow all traffic between networks in this environment setting. For more information, see Routing between networks in the same environment. To help you keep track of your network connections, you can see a list of all the networks a network is connected to. Navigate to the Network Settings page. Click on the Show connected networks link to display all of the networks that connect to this network. Navigate to the Network Settings page in your environment. Click on the Show connected networks link for the network you are interested in. Click Disconnect next to the network connection you want to remove. Enable NAT to prevent IP address space overlap. The information below applies only if you are not using NAT on your linked environments. A connection between networks doesn’t work if their IP address spaces overlap. Overlapping IP address spaces may prevent traffic from being routed to the correct network. In this case, Skytap prevents you from creating the connection. The address spaces are identical. For instance, the IP address 10.0.0.0 with subnet size of 16 (written in CIDR notation as 10.0.0.0/16) can’t be connected to another network with the IP address of 10.0.0.0 and a subnet mask of 16. One of the network address spaces is fully contained within the address space of another network. For instance, the address space 10.0.0.0/24 is fully contained within 10.0.0.0/16 (the /24 subnet represents a portion of the address space available in the /16 subnet). Skytap checks for overlap whenever you edit a network, create a new network, or create a connection between networks using ICNR. When you connect networks from different environments together, Skytap checks that none of the networks connected to either environment have IP address overlaps. This means that additional networks connected to one of the two connecting networks can cause the connection to fail if its IP address overlaps. If Skytap detects an overlap, it displays an error message. Examples of the most likely errors, and recommended steps to fix them, are described below. Network A (10.0.0.0/24) has overlapping address space with Network B (10.0.0.0/16). Change the IP address space of Network A or Network B (for example, to 9.0.0.0). Network A (10.0.0.0/24) has overlapping address space with Network C (10.0.0.0/16), which is in the same environment as Network B. Networks in the same environment are automatically connected to each other. Network A (10.0.0.0/24) has overlapping address space with Network C (10.0.0.0/16), which is in a third environment that is already connected to Network B. Choose a different, non-overlapping, IP address space for the network you are editing. This error condition occurs when trying to connect networks that are connected to other networks over a VPN connection. The figure below illustrates the error condition. Network B is connected to the corporate network over the VPN connection. Remote network, Network C has the address space 10.0.0.0/16. When you try to connect Network A to Network B in Skytap, Network A overlaps with Network C.